Why ambient? A math teaching style that’s whole and all encompassing, with themes that repeat many times through the years, is most likely to be effective and successful. Today’s post will focus on a look at the California State and National Math Standards as a means of comparison to the Common Core Math Standards. The following is a listing of both standards as they appear in the Math By Hand binder, along with the form drawing activities and lessons and how they relate to each of the standards. 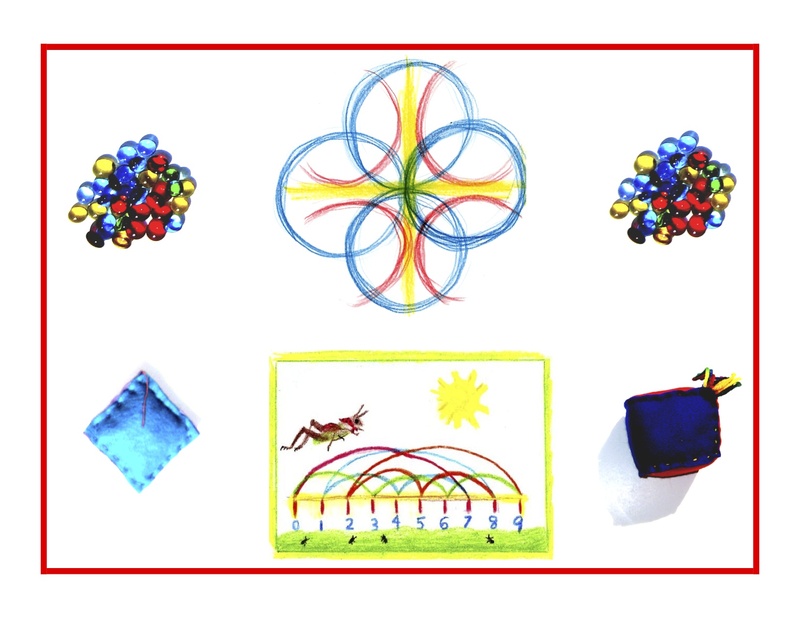 1/ Analyze characteristics/properties of two- and three-dimensional geometric shapes, develop mathematical arguments about geometric relationships. 1/a) Recognize, name, build, draw, compare, and sort two- and three-dimensional shapes. 1/b) Describe attributes and parts of two- and three-dimensional shapes. 1/c) Investigate and predict the results of putting together and taking apart two- and three-dimensional shapes. *The geometric forms employed are two-dimensional shapes on paper, but they awaken awareness of their corresponding forms in the general environment. *Attributes of the forms are described extensively in introductory stories. *Symmetrical or mirrored forms can be seen as parts of the whole, taken apart. 3/ Apply transformation and symmetry to analyze mathematical situations. 3/a) Recognize and apply slides, flips, and turns. 3/b) Recognize and create shapes that have symmetry. *The recognition and creation of symmetrical shapes also then transforms into forms that flip and turn from one side to the other. 4/ Use visualization, spatial reasoning, geometric modeling, to solve problems. 4/a) Create mental images of geometric shapes using spatial memory and spatial visualization. 4/b) Recognize and represent shapes from different perspectives. 4/c) Relate ideas in geometry to ideas in number and measurement. 4/d) Recognize geometric shapes and structures in the environment and specify their location. *When the forms are moved on the floor, wonderfully complex mental images of the geometric shapes result, utilizing spatial memory and visualization. *Shapes are seen from different perspectives in the metamorphosis drawings. *Ideas in number are related to ideas in geometry, and ideas in measurement are sensed experientially as the forms are balanced in movement and on the page. *While moving the forms, directions about location are freely given, while attributes of direction, such as near/far, above/below, up/down, etc., are also explored. 2.0) Students identify common geometric figures, classify them by common attributes, and describe their relative position or their location in space. 2.1) Identify, describe, and compare triangles, rectangles, squares, and circles, including the faces of three-dimensional objects. 2.2) Classify familiar plane and solid objects by common attributes, such as color, position, shape, size, roundness, or number of corners, and explain which attributes are being used for classification. 2.3) Give and follow directions about location. 2.4) Arrange and describe objects in space by proximity, and direction (e.g., near, far, below, above, up, down, behind, in front of, next to, left or right of). *Many geometric forms, including triangles, squares, and circles, are experientially identified, described, and compared. *Consistently working with the forms also allows a greater awareness of familiar, everyday objects and their relationship to the forms and their attributes. *While moving the forms, directions about location are freely given; attributes of direction, such as near/far, above/below, up/down, etc., are also explored. My purpose in posting this is to demonstrate the differences between the former standards and the Common Core. And to ask why we need to fix what isn’t broken. The simplicity and straightforwardness of the former standards is more than adequate to their purpose. It does make sense to have consistent standards that apply across all states, but taking a step back and reevaluating the Common Core’s efficacy and grade appropriateness may be the best approach, in light of the difficulties experienced by children, parents, and teachers with the Common Core’s implementation and methods of evaluation. True knowledge ensues in an environment dedicated to imaginative, creative knowing, where student and teacher alike surrender to the ensuing of that knowledge as a worthy goal. Back to the Common Core, geometry, form drawing and how they can all fit together in Grade 1. Tune in!